2010, Real Model, MPA 003. 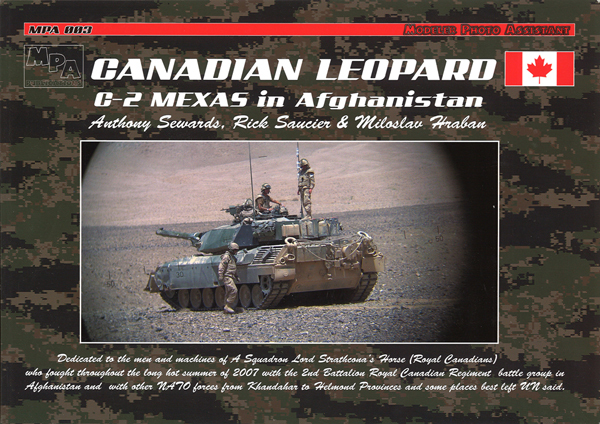 Real Models from the Czech Republic have published this colour album of the Canadian Leopard C2 MEXAS. 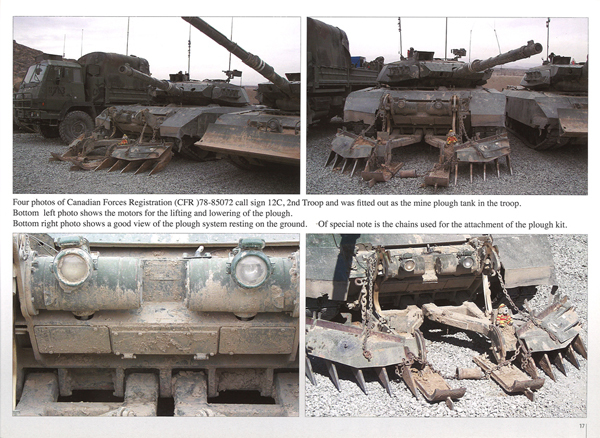 It is dedicated to the men and machines of A Squadron, Lord Strathcona's Horse (Royal Canadians), who fought throughout the summer of 2008 with the 2nd Battalion Royal Canadian Regiment battle group in Afghanistan alongside other NATO forces from Khandahar to Helmond Provinces. Using photos taken by Anthony Sewards and Rick Saucier, compiled into an attractive album by Real Model's Miloslav Hraban, it includes colour full view and walkaround captioned photos. Anthony and Rick actually served on these tanks at the time, so they both has unlimited access to the machines which makes for a compelling collection of photos. In the 80 pages are over 250 photos, some of which are full page size. These tanks underwent constant change whilst in theatre, so the photos here are limited to a specific period during Anthony's tour in 2007 and Rick's tour in 2008/2009. 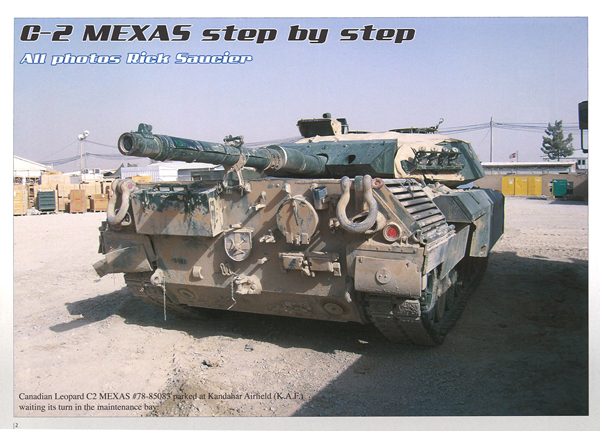 For a more detailed history of the C2 MEXAS in Afghanistan, Leopard Club's own Fact File, LFF03 Leopard C2 MEXAS in Afghanistan (also written by Anthony Sewards) is a useful companion to this book, as are LFF04 Leopard 1 Dozer, LFFF05 Leopard 1 Mine Roller and LFF06 Leopard 1 Mine Plough. 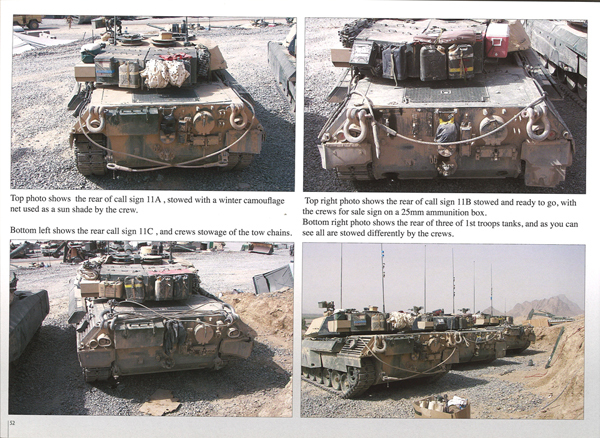 The book is broken down into eleven chapters showing the tanks on combat operations - in the Forward Operating Bases (FOB) - and walkaround type images of specialised equipment. 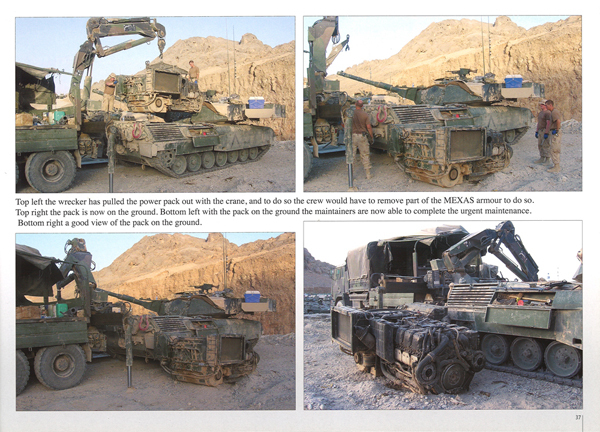 Effort is made in the book to point out the individual vehicle registration numbers, call signs, tank names and Troop turret artwork to the reader. 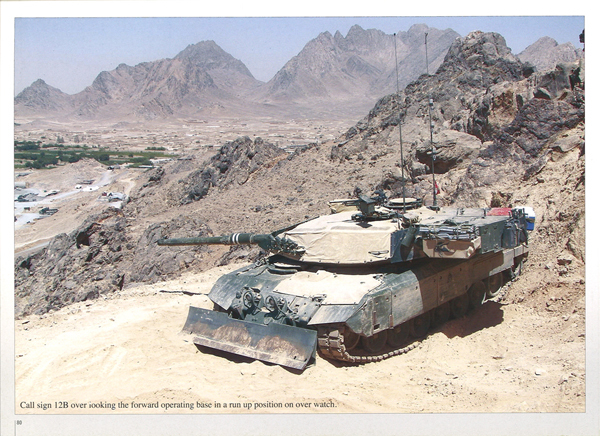 This will greatly assist a modeller wanting to depict a specific tank. Prospective purchasers should not shy away from the price of the book as it must be noted that each of the chapters should be looked at as a separate reference article as could be found in a multitude of modelling magazines. The cost effectiveness of having multiple high-quality images all in one book as opposed to having to purchase multiple issues of magazines is a bargain in my opinion. With the release of several conversion kits for the C2 MEXAS from Perfect Scale Modellbau, Trackjam and Legend, this book is an invaluable reference tool for those wanting to convert the old Italeri/Revell kit into one of these impressive, combat-proven beasts. Thoroughly recommended for all Canadian Leopard nuts!